Scenes from Fifth Avenue, as a very special 2015 Pride March celebrates the legalization of gay marriage across the nation. Hilton team member Christopher Hill, right, proposes to his partner Stephen Smith on Hilton's Equality@PLAY float as Hilton celebrates Pride Month on June 28, 2015 in New York City. A participant marches in the Gay Pride Parade on June 28, 2015 in New York City. A participant flashes victory sign from back of the motorbike during the 2015 New York City Pride parade in New York on June 28, 2015. A participant dances during the 2015 New York City Pride parade in New York on June 28, 2015. Spectators watch the 2015 New York City Pride parade in New York on June 28, 2015. Participants carry rainbow flags during the 2015 New York City Pride march in New York on June 28, 2015. 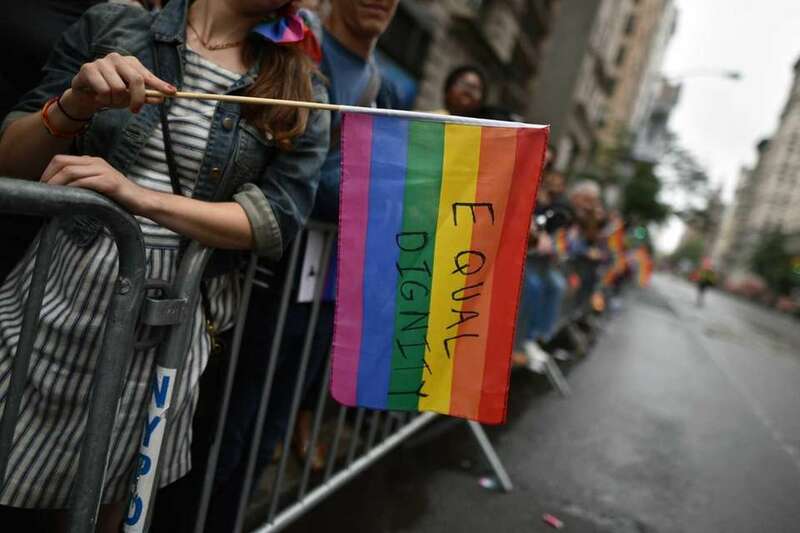 A participant waves a rainbow flag during the 2015 New York City Pride march in New York on June 28, 2015. Animal rights activists from PETA, LION and NYCLASS join the 2015 New York City Pride parade on June 28, 2015. A participant in support of legalizing cannabis gestures during the 2015 New York City Pride march in New York on June 28, 2015. A participant smiles during the 2015 New York City Pride march in New York on June 28, 2015. Participants march during the 2015 New York City Pride parade in New York on June 28, 2015. A participant greets the crowd during the 2015 New York City Pride march in New York on June 28, 2015. A participant dances during the 2015 New York City Pride march in New York on June 28, 2015. A participant wears multi-colored wings while marching in the Gay Pride Parade on June 28, 2015 in New York City. Frances Goldin, who has two lesbian daughters, holds a sign while watching the Gay Pride Parade on June 28, 2015 in New York City. People dance during the Gay Pride Parade on June 28, 2015 in New York City. Participants from the Indonesian LGBT society of New York march in the Gay Pride Parade on June 28, 2015 in New York City. A couple kisses before taking part in the 2015 New York City Pride parade in New York on June 28, 2015. Participants march in the Gay Pride Parade on June 28, 2015 in New York City. Participants pose for a photo during the 2015 New York City Pride parade in New York on June 28, 2015. A participant wearing a wedding dress marches in the Gay Pride Parade on June 28, 2015 in New York City. Revelers celebrate love at the 2015 New York City Pride march on June 28, 2015 in New York City. Lee Hencen, left, and Murray Schechter kiss during the Pride March on June 28, 2015 in New York City. New York City mayor Bill de Blasio joins the march during the 2015 New York City Pride March on Sunday, June 28, 2015, in Manhattan. Spectators await the start of the 2015 New York City Pride March on Sunday, June 28, 2015, in Manhattan. The parade starts uptown and ends near the Stone Wall Inn in Greenwich Village. Mayor Bill de Blasio and family take part in the 2015 New York City Pride march on June 28, 2015 in New York City. New York Governor Andrew Cuomo takes part in the 2015 New York City Pride march on June 28, 2015 in New York City. Love is celebrated at the 2015 New York City Pride march on June 28, 2015 in New York City. Spectators during the 2015 New York City Pride March on Sunday, June 28, 2015, in Manhattan. The parade starts uptown and ends near the Stone Wall Inn in Greenwich Village. New York Gov. Andrew Cuomo waves to the crowd during the 2015 New York City Pride March on Sunday, June 28, 2015, in Manhattan. New York City Mayor Bill de Blasio gets ready to step off with his wife Chirlane McCray, and his children -- Chiara and Dante -- during the 2015 New York City Pride March on Sunday, June 28, 2015, in Manhattan. New York City Pride March grand marshal Sir Ian McKellen waves to the crowd at the start of the 2015 parade on Sunday, June 28, 2015, in Manhattan. New York City Council members march during the 2015 New York City Pride March on Sunday, June 28, 2015, in Manhattan. Melissa Mark-Viverito, the Speaker of the New York City Council, center, raises her arms. Preparations before the 2015 New York City Pride march on June 28, 2015 in New York City. Grand Marshals, Sir Derek Jacobi (L) and Sir Ian McKellen speak at a press conference before the 2015 New York City Pride march on June 28, 2015 in New York City. NYC celebrates Supreme Court's marriage equality rulingNew York City is celebrating the Supreme Court's ruling. LGBTQ bars and parties to hit up Let the good times roll. Everything you need to know for Pride Weekend in NYCIt's time to celebrate! Where to celebrate pride this monthHere's your guide to events around New York City.